VIM: Greetings Alexandria, your recent show "Outer Space, Inner Freedom" premiered last First Friday at Blackbird Studios. How has these last couple of weeks been for you? What has been the overall impression you have received from guests viewing your show? ALEXANDRIA LEE: It has been great! A lot of people have come to see it. I get so much different feedback from different people, which I find as a good sign. I want my work to be like a good movie- everyone will take some unique interpretation of it, depending on the own story of their lives. Everyone seems to relate to my message in their own way. VIM: I was privileged enough to get a private viewing of your show when we had the photo shoot for VIM. It was great hearing your perspective on each art piece. How did this collection come about? ALEXANDRIA LEE: Thank you. I have been working with the theme of “the importance of freedom” since about 2007. I believe freedom is the most important thing in this world that all other good derives from. All my paintings come to me first as subject matter that intrigues me and that I find relevant to this day and age, and then it comes to me in visions. For example, one of my paintings comments on the freedom and captivity the extreme access we have to technological communication, while another is about the freedom of expression and where new ideas come from, while another is about the freedom of living out of you heart and letting go of the mind. VIM: You mentioned how you use people in your life in your artwork at times. How much of an influence do they have on the finished pieces? ALEXANDRIA LEE: I have always found painting portraits and figures to be very satisfying to me and my paintings are about humanity at their essence. The ideas I come up with in my head require a model to pose for me in the way I envision. I prefer to add a level of depth with the models I choose to add another personal layer to the painting. For example, one of my paintings in the show “One Dollar” is partially about the expression “two sides to one coin”. I have two older sisters, who can look and act very similar but at the same time, can be total opposites: I used them both as the models for that painting. I guess the people in my artwork become like characters in a play that I have written and directed... the painting isn’t about them; it’s more like that they fit the role. VIM: In your artist statement you state that your artwork is about your "passion for freedom: freedom as it pertains to each individual in his or her own personal life as well as it pertains to people as a collective society." There is a certain piece in your collection that seems to reflect just that, the headless woman near the staircase, it's a powerful statement. How did that piece evolve? ALEXANDRIA LEE: Yes, I mentioned that painting before. That painting evolved a lot. I wanted to do a piece about the power of light overcoming darkness. The beautiful friend and model I used for the painting was struggling with exactly that same issue. I didn’t get the idea to make her headless until well into the painting. I had been reading about the importance of sometimes losing your “mind” and going into a state of “no-mind”, and that is where meditation begins. In my experience as a painter and performing artist, the point where I really stop thinking is where the magic or “meditation” steps in. It is a very freeing feeling. VIM: Let's talk a bit about your past shows. 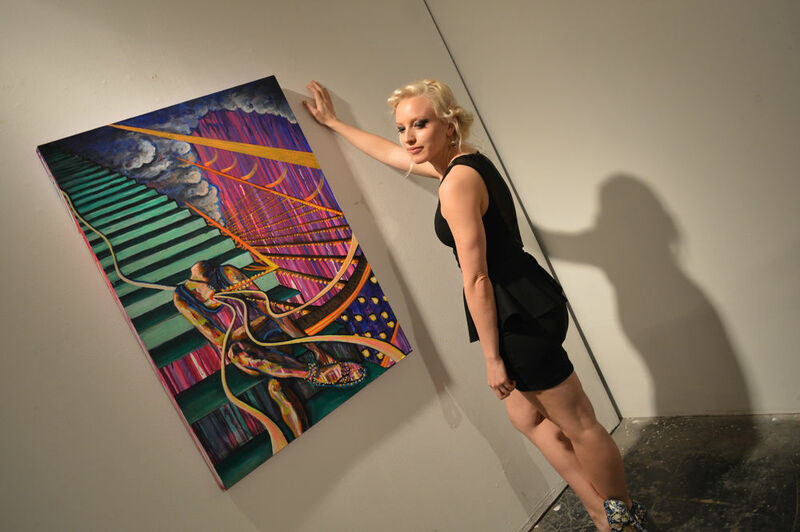 After your third year in art school, you received one of the most prestigious awards for local artists, winning First Place in the Contemporary Arts Collective Annual Juried Exhibition in 2009 for your painting "Concentration." That year the show was judged by Shana Nys Dambrot, an art critic, curator, and author based in L.A. How was that experience for you? ALEXANDRIA LEE: Yes, that was a big surprise to me at the time. I had actually been a bit discouraged in my artwork, and I wasn’t initally going to enter into the show. I’m so glad I did. Shana is an amazing person who is so passionate and knowledgable about the art world. She curated a wonderful group show in Beverly Hills at Garboushian Gallery in late 2011 which I was apart of. VIM: You were nominated for RAW Artists "Best Visual Artist in Los Angeles 2012" and then later invited to show at the RAW Artists National Show in 2012 as a Founder's Favorite artist of the year. I've been to the RAW shows here in Las Vegas and was nominated and each one is a gala event featuring lots of local great talent in art, fashion, and music. How was the show in L.A.? ALEXANDRIA LEE: It was an honor to be apart of the shows and be chosen out of so many other artists. There is such a vast amount of talent at these shows and I had a great time being amongst and checking out all the other various artists! RAW is a very cool organization. VIM: We have a mutual friend with local performance dancer Torrey Cole, she herself won RAW Las Vegas Performance Artist of The Year. I was actually up against her in the same category. Since then we have become the best of friends. You use her in one of your new paintings. How is it working with her? ALEXANDRIA LEE: Torrey and I have been friends for 13 years. We are both extremely passionate about the importance of arts of every kind and in being constantly involved in that. She has used me as a dancer in her choreography and I have used her in my paintings. We both grew up in Las Vegas, but had moved away- she to New York City and I to Los Angeles....we were brought back to Las Vegas at the same time for different reasons and now have a common goal to make a good cultural contribution to our hometown. We plan to continue to work closely together to bring more visual and performing arts to the Las Vegas community in any way we can. VIM: You are also a performing artist and actress who has worked in film, commercials, and theater. Last year you starred as the first female character to perform with the Blue Man Group in their Las Vegas strip show, playing the robot character named "Showbot." It must have been an exciting opportunity. What other work have you been in? ALEXANDRIA LEE: Performing as Showbot for the Blue Man Group was one of my most favorite things I have ever done. I got to be a robot and play around with audience members and the Blue Men and be surrounded by such amazingly creative people. As an actress and dancer I have done just about every medium: short films, music videos, theater, commercials, industrials, hosting....I’ve performed as pretty much every Disney Princess for private events and I was even a photo double for Natalie Portman for a few weeks on a movie filmed in Nevada. A wide range of random and unique things! I guess it all comes down to my intense love of expression....that's how I wind up doing a range of different stuff. VIM: We have talked about starting a local art collaborative in the same vein as Andy Warhol's The Factory, where artists of all genres come together to work on projects and create community. I am eager to restart again this year the "Art Talk" brunch shows we had Sunday's at Mingos with Torrey Cole and other artists. What's your ideal view of where things can go? ALEXANDRIA LEE: Yes!!! Well, ideally, we would have a great venue to host art parties, performances, classes, and salons, with studio space for people to work on their craft near each other: to have that connection where feedback and ideas are being bounced around, a place to learn and a place to kickback. The goal would be to attract the most passionate people, and to become well-known as a hub for creativity and a cool place not just to check out, but to hang out, to collaborate, to create. Kind of like an arts college with zero discipline, zero homework and the only expectation is that you are contributing to the group on some level. In fact, I think the ultimate goal would be that people would become excited about contributing and sharing and would be inspired to do more art than ever before. VIM: What is up next after this exhibition? Any collaborations in the works? ALEXANDRIA LEE: At my current exhibition at Blackbird Studios I collaborated with Wolf189 and Christopher Kachurak to create an interactive art exhibition in the last room. We are all very happy with it and it was truly a collaborative work! Go check it out! I will continue to perform more with Showcreators productions as Showbot. There is a public art piece I am really looking forward to doing downtown on Fremont St which may be collaborative. Also I plan to be one of the artists to paint on the The Life Cube Project, an interactive community art installation created by Scott Cohen. The mission of The Life Cube Project is to get people to write down their goals, wishes, dreams, and aspirations with the belief that there is a better chance of achieving them. I plan on doing more with the Las Vegas Swing Dance community as well! And of course, if we do end up creating our own "Factory" that would be a great highlight!